At twenty-two, Grace Avalon left her body to be swept into luminous kaleidoscopic light bearing images of places she’d never seen. Escaping from her abusive life, in joyous laughter she surrendered to the light. Her husband placed her in a mental hospital—over twenty years the places in her euphoric visions actually came true. Through her inner voice, awakened by her symbolic visions, Grace found a compass fixed within her for her path out of abuse. Grace teaches that everyone can hear their own inner voice, and everyone’s symbolic messages are different. Grace is led by a mighty companion out of a secret life of physical, emotional, and sexual abuse amidst the organic oneness of our collective dream. What Grace saw as wounds turned into portals for her new self to appear. She shares profound healing when overcome by flashbacks of blocked abuse, including past lives—all connecting the dots to her soul. Grace’s path out of hell also becomes a demonstration of A Course in Miracles (modern spiritual philosophy) made practical. 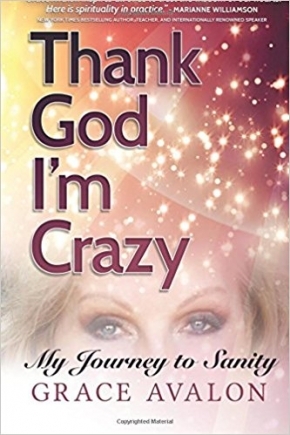 Thank God I’m Crazy includes pictures of places which actually took place in her life over several decades, as seen in her visions. Grace Avalon, teacher and intuitive counselor, has taught A Course in Miracles for nine years. She gives presentations, seminars and workshops for anyone whose known abuse, thought they were crazy, or wants to live a meaningful life.